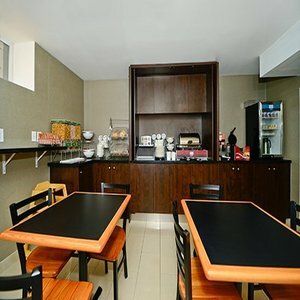 Welcome to the Comfort Inn, a downtown hotel near the CN Tower. The entertainment and financial districts. The Comfort Inn is centrally located in the heart of downtown Toronto within walking distance to the Toronto Eatons Centre, Dundas Square Canan Theatre and Hockey Hall of Fame. Only minutes of the Financial District and Ryerson University.The Air Canada Centre, CN Tower and Rogers Centre are in close proximity.This is the perfect hotel for your Toronto leisure or business travel.Off site parking available for 25.00 per night. pet is never to be left alone at any given time and that they must be caged.No onsite parking available.Taxes include 3 percent DMP.Valid photo ID and valid Credit card required for all reservations. Credit card will be authorized for room and tax along with a 200.0 security deposit.